Dickson Paraffin Baths are luxuriously finished with solid hardwood moldings that are contoured to provide a comfortable, cool rest for an arm or leg. 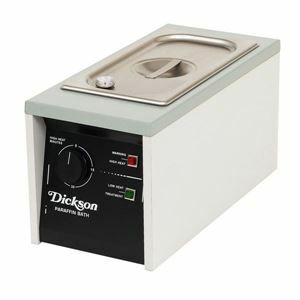 Dickson models are also designed to provide luxuries to the caregiver. Each unit has a high-heat sanitizing circuit. This model utilizes a timer-controlled high heat sanitizing circuit. These space-saving and economical Dickson paraffin baths are normally placed on a counter or on the floor.